Each toddler wants autonomy! The toddler’s increased abilities intensify his/her active exploration of the environment and expand his/her learning opportunities. However, as the toddler ventures out to discover and learn new things, his/her need for protection and safety continues to exist. At LFDP, we understand the polarity of a toddler’s behavior and while we encourage his/her exploration, learning, and independence, we also offer him/her the reassurance he/she needs. The toddler’s emerging language skills and developing cognitive abilities are evident during our group times and are encouraged and supported by our teachers. Our book reading, finger play, nursery rhymes, and songs provide each toddler with opportunities to practice the words he/she already knows, to acquire new ones, and to develop his/her listening and communication skills. 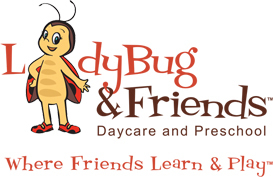 Mia, our Ladybug, is here to help, and her name is one of the words we are learning this time! The knowledge a toddler has already attained enhances his/her exploration and learning. Through sensory play, manipulation of toys, and other learning activities, each toddler develops his/her ability to make connections and to learn from the environment. Supported by our teachers and Mia, each toddler discovers new things about the world around him/her and builds understanding of how things work. Art projects are fun activities for a toddler! Finger and brush painting engage each toddler in an enjoyable experimentation with colors and other painting materials and foster his/her developing fine motor skills and hand-eye coordination abilities. At LFDP, our teachers concentrate on offering each toddler the experience of creating something new, encouraging his/her sense of creativity. Mia is our best art guide! Interest in playing out scenarios emerges at this age. Familiar and routine activities, such as cooking in the kitchen, putting the baby to sleep, and playing the doctor, are some of the toddler’s and Mia’s favorite scenarios. At LFDP, our teachers recognize the beginnings of pretend play in each toddler and provide him/her with the support he/she needs to build and enjoy his/her play and to develop his/her social and language skills. Movement time includes exciting and challenging physical activities. Running, jumping, climbing and riding a bike boost each toddler’s eagerness for exploration and the development of new skills. Encouraged and guided by our teachers and Mia, each toddler progresses from beginner to advanced, mastering the skills at his/her own pace. By playing actively indoors and outdoors, each toddler develops muscle strength, endurance, agility, coordination, balance, and flexibility, as well as building confidence and social skills thru interaction with the other kids. At LFDP, we implement a highly personalized, developmentally appropriate, and integrated curriculum, which promotes development and lifelong learning. Our hands-on activities and experiences combine play and learning, offering each child opportunities to explore and construct knowledge about the world. Caring and fun, Mia guides and supports each child through his/her daily learning activities and experiences.